Here's an easy Fantasy Fudge recipe complete with step by step photos and simple instructions. You can even make your own marshmallow creme from original recipes, if you want to. And, as a bonus for chocolate lovers, the old fashioned Havana Fudge is an absolute delight. 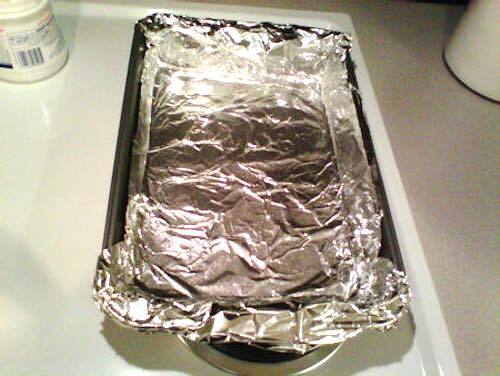 Line your pan (13 x 9 inches) with aluminum foil and lightly spray the foil with cooking spray. This makes cleanup easier and allows you to easily cut the fudge later. 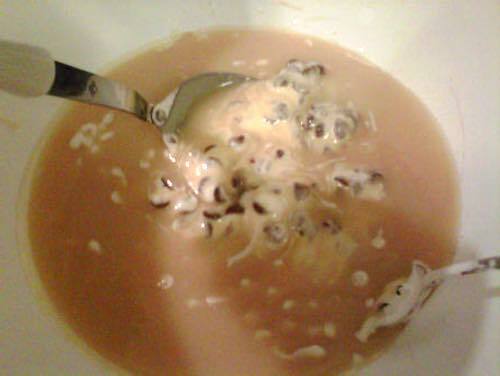 In a large bowl, combine the marshmallow creme, chocolate chips, and vanilla. Also add chopped nutmeats, if desired. Combining these ingredients now simplifies combining all the ingredients later on. 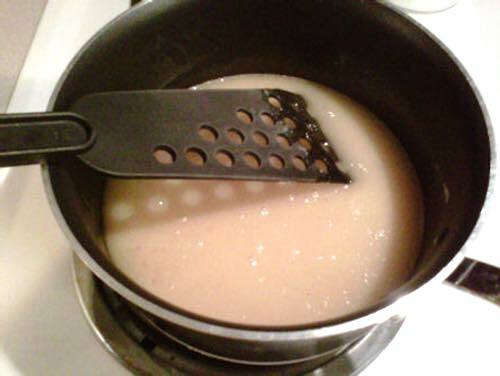 In your nonstick saucepan, combine the butter and milk on Medium heat. 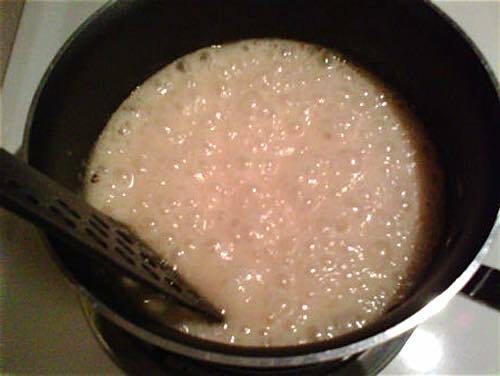 After the butter and milk are well mixed, add the sugar and continue stirring, making sure to keep your spatula on the bottom of the pan as much as possible to prevent the sugar mixture from burning. Once all three ingredients are combined into a liquid, stir constantly. You can stir round and round or in a figure 8 motion, just keep the spatula on the pan's bottom at all times. Do around the sides as well, just to be sure. Bring the mixture to a full rolling boil and boil the mixture for about 5 minutes, until a small amount of mixture dripped from the spatula into a cup of cold water forms a very soft ball. Then, remove from heat. The more often you make this Fantasy Fudge recipe, the more you'll be able to tell when it's ready. 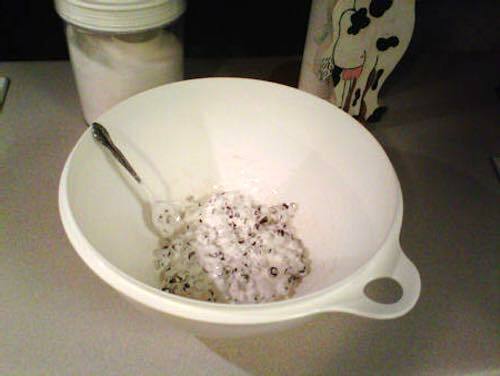 VERY carefully, pour your mixture into the large bowl with the remaining ingredients. Quickly yet carefully stir to combine all the ingredients together. Pour your finished fudge into the pan you prepared earlier. 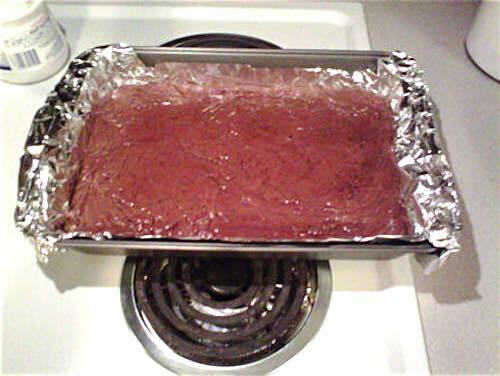 Using your spoon, carefully push the fudge into the pan's corners. 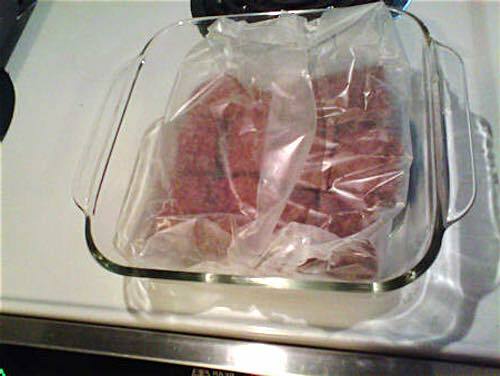 Cover the pan with foil and place in the refrigerator for safe keeping and to ensure it hardens quickly. 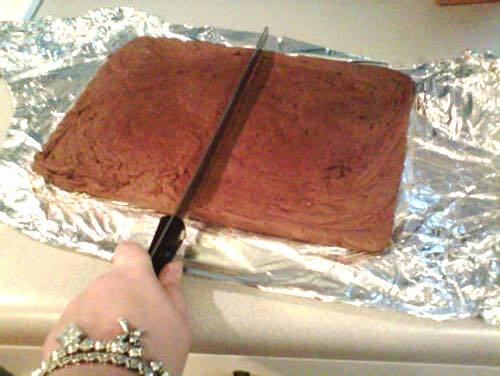 When you're ready to cut your Fantasy Fudge, lift the foil from the pan. Cut your fudge in half, then cut each section in half. Continue to do this until you have small squares, approximately 1 inch in size. Fantasy Fudge tends to be very rich tasting, so smaller squares are better. People can always go back for seconds. Line your container with wax paper and add your fudge piece by piece. Layer it with wax paper between the layers so that the fudge doesn't stick together. 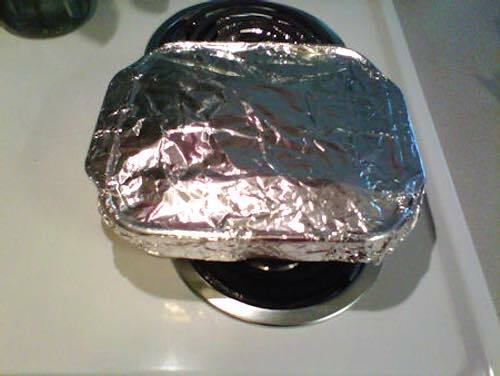 Cover with the sheet of aluminum foil you covered it with earlier, and put it back in the fridge for serving later. Enjoy your homemade fudge! If you master this Fantasy Fudge recipe, you should be prepared to cook it often as your friends and family will absolutely love this melt-in-your-mouth candy! You can't say you haven’t been warned, so make lots. Havana Fudge tastes amazing on its own, but with the marshmallows added, it simulates a fantasy fudge recipe with marshmallow creme. Be sure to try it both ways! 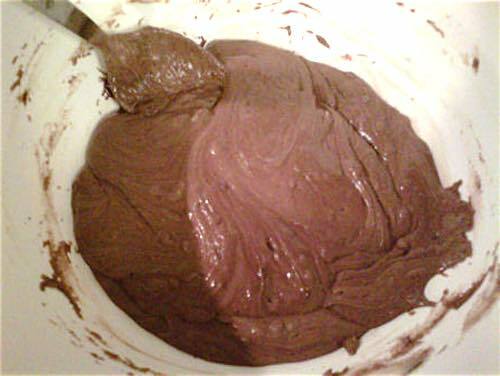 For this chocolate fudge recipe, combine cocoa powder, sugars, and salt; add water and milk, and place over low heat. Stir constantly, until all sugar is dissolved and the mixture boils. Continue cooking without stirring, until a small amount of mixture forms a very soft ball in cold water. Then, remove from heat. Stir in butter and vanilla. Cool to lukewarm, then beat until mixture thickens and loses its gloss. Add nuts and pour immediately into greased pan, 8 x 4 inches. 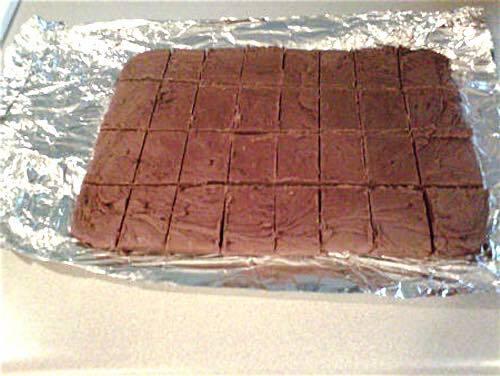 When chocolate fudge has cooled, cut in squares. Makes about 1-1/2 dozen large pieces. Very Good. Marshmallow Variation: Arrange 14 marshmallows, cut in halves, in bottom of your greased pan, 8 x 4 inches, cut sides facing up. Pour beaten chocolate fudge mixture over the marshmallows. Cut in squares when cold.